Quantitative PCR (qPCR) is a widely used technique for gene expression analysis. A common normalization method for accurate qPCR data analysis involves stable reference genes to determine relative gene expression. Despite extensive research in the forest tree species Populus, there is not a resource for reference genes that meet the Minimum Information for Publication of Quantitative Real-Time PCR Experiments (MIQE) standards for qPCR techniques and analysis. 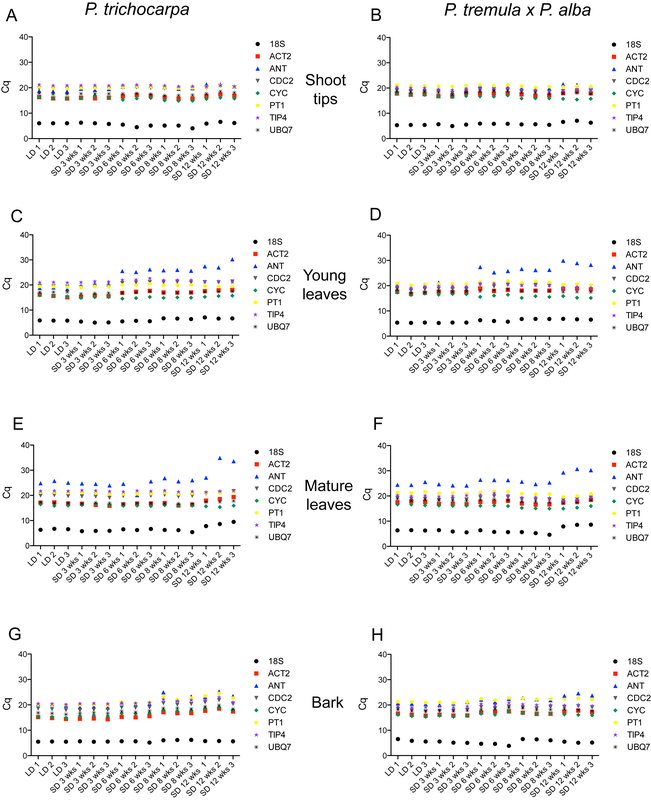 Since Populus is a woody perennial species, studies of seasonal changes in gene expression are important towards advancing knowledge of this important developmental and physiological trait. The objective of this study was to evaluate reference gene expression stability in various tissues and growth conditions in two important Populus genotypes (P. trichocarpa “Nisqually 1” and P. tremula x P. alba 717 1-B4) following MIQE guidelines. We evaluated gene expression stability in shoot tips, young leaves, mature leaves and bark tissues from P. trichocarpa and P. tremula. x P. alba grown under long-day (LD), short-day (SD) or SD plus low-temperatures conditions. Gene expression data were analyzed for stable reference genes among 18S rRNA, ACT2, CDC2, CYC063, TIP4-like, UBQ7, PT1 and ANT using two software packages, geNormPLUS and BestKeeper. GeNormPLUS ranked TIP4-like and PT1 among the most stable genes in most genotype/tissue combinations while BestKeeper ranked CDC2 and ACT2 among the most stable genes. This is the first comprehensive evaluation of reference genes in two important Populus genotypes and the only study in Populus that meets MIQE standards. Both analysis programs identified stable reference genes in both genotypes and all tissues grown under different photoperiods. This set of reference genes was found to be suitable for either genotype considered here and may potentially be suitable for other Populus species and genotypes. These results provide a valuable resource for the Populus research community. Grown for timber, paper and bioenergy, the forest tree genus Populus is one of the most widely cultivated tree genera and has become a model for tree research . Within this genus, two genotypes, P. trichocarpa and the hybrid P. tremula x P. alba are frequently used in molecular and genomic research. P. trichocarpa (Torr. And Gray) genotype ‘Nisqually-1’ has become a vital resource since completion of genome sequence  while P. tremula x P. alba clone INRA no. 717-1B4 is widely used for molecular biology research because of the ease and efficiency of in vitro shoot regeneration and genetic transformation methods . These two genotypes have been extensively used to study seasonal nitrogen cycling and storage, SD associated growth cessation, leaf senescence, bud development and dormancy [4–11]. Identifying stable reference genes in various tissues in plants grown in both SD and LD conditions will help facilitate future research of seasonal traits in Populus using qPCR. Results from qPCR assays and the conclusions based on qPCR data, have been an invaluable source for studying gene expression yet the broad application of qPCR methods requires standards that promote accuracy, reproducibility and transparency. There has been rapid adoption of a specific set of standards termed the Minimum Information for the Publication of Real-time Quantitative PCR Experiments (MIQE) [12–14]. The MIQE guidelines are a set of ideal practices for qPCR experiments that aim to reduce the publication of inaccurate data that could be interpreted to make incorrect or misleading scientific conclusions. The scope of the guidelines is extensive and includes stipulations for experimental design, sample acquisition, preparation and quality control, reverse transcription and qPCR reactions and data analysis. The guidelines also encompass rules related to nomenclature, particularly using the term quantification cycle (Cq) instead of threshold cycle (Ct) and the term reference genes as opposed to housekeeping genes . Despite the wide acceptance of the need for experimental and publication standards, Gutierrez et al. and Guenin et al. note that plant biology research has been slow to adopt these standards and these guidelines are often ignored in publications. An important component of the MIQE guidelines is the appropriate analysis of raw fluorescence data to normalize technical variation. A routine method incorporates data from stable reference genes to calculate relative gene expression. Stable reference genes are generally defined as genes with uniform transcript abundance across all samples that is above background fluorescence levels . This is determined by statistical analyses that estimate gene expression stability for a set of candidate reference genes. Data for stable reference genes can then be included in normalization analyses . QPCR validation is crucial for accurate data analysis and involves techniques that test if fluorescence data are a direct measure of gene expression in experimental samples . This concept is illustrated by PCR amplification efficiencies (E), which are calculated by quantifying the increase of amplified product after each thermocycle in samples with a range of transcript abundance [12, 18]. For example, aberrant product synthesis due to enzymatic inhibitors or secondary structures of the primers may not reflect the actual transcript quantity [18, 19]. PCR efficiency values for each primer pair are included in calculations for stability and relative gene expression analyses [20, 21]. Two reports that fail to conform to the publication standards outlined in the MIQE guidelines have been published evaluating reference genes for qPCR analysis in Populus[22, 23]. The first report by Brunner et al. , omits the PCR efficiencies for each primer pair as well as the size of the amplification product. This work used ANOVA and linear regression techniques that have been supplanted by the availability of advanced statistical programs that rank reference gene stability [20, 21]. In the second report by Xu et al. , all efficiencies are outside of the range of acceptable efficiencies (E = 1.9-2.1), indicative of possible unreliable product amplification that questions the validity of the findings [18, 24]. Besides the technical aspects of these previous studies, both studies also used interspecific hybrids (P. deltoides x P. nigra or P. trichocarpa x P. deltoides) to conduct the analysis. Because of the lack of a detailed report of qPCR reference genes that conform to MIQE guidelines in poplar we conducted a MIQE compliant examination of reference genes in two poplar genotypes that are extensively used in genomic and transgenic studies, P. trichocarpa (Nisqually-1) and P. tremula x P. alba clone 717 1-B4. In this study we report on the gene expression stability of 8 candidate reference genes (18S rRNA, ACT2, CDC2, CYC063, TIP4-like, ANT, UBQ7, and PT1) in 4 different tissues from plants grown under various photoperiodic conditions. Analyses were performed with the software packages geNormPLUS and BestKeeper. The results of this study provide a resource for Populus researchers and demonstrates the use of MIQE guidelines to the study of poplar gene expression. To evaluate candidate reference genes for gene expression studies in P. trichocarpa and P. tremula x P. alba, qPCR assays were performed on triplicate biological samples from shoot tips, young leaves, mature leaves and bark at 5 time points under long day or short day photoperiods and short day photoperiods supplemented with low-temperatures. Reference genes were selected from existing literature on Populus (Table1). Gene symbol, Populus locus name (Phytozome), NCBI Arabidopsis thaliana ortholog accession number, gene name, function (annotation from Phytozome) and reference for each gene. a accession number for Populus. b primers were not redesigned. PCR efficiencies were calculated from the slopes of standard curves for all primer pairs and were found to be within the acceptable range of E = 1.9-2.1 for both P. trichocarpa and P. tremula x P. alba (Table2). Comparison of the same primer pairs between each genotype showed that the efficiencies were similar. The largest difference in PCR efficiencies between genotypes was 0.049 (or 4.9%) for TIP4-like and the smallest was 0.002 (or 0.2%) for CYC063. Expression levels of the candidate reference genes, presented in quantification cycle (Cq) values, showed that transcripts for all reference genes were detected in all samples for all tissues (Figure1). Cq values are the number of cycles when fluorescence crosses a threshold above background levels . As shown in Figure1, the mean Cq values of all reference genes clustered together, around 20 cycles, except for 18S rRNA where very low mean Cq values were observed around 5 cycles, indicating large transcript abundance. Furthermore, the Cq values for ANT tended to show greater variance than the other candidate genes, which is particularly evident in young and mature leaves of SD treated plants (Figure1, C, D, E, F). Shoot tips/buds and bark samples exhibited the least variation in mean Cq values of all genes amongst all the tissues. Primer sequences, PCR product sizes, annealing temperatures, PCR amplification efficiencies in P. trichocarpa and P. tremula x P. alba for each candidate reference gene. Cq distributions for each candidate reference gene. Expression data for reference genes where each graphed point represents the mean of the technical replicates. Each graph shows the quantification cycle (Cq) distribution for candidate reference genes in shoot tips/buds, young leaves, mature leaves and bark of both genotypes (P. trichocarpa and P. tremula x P. alba). LD, long day photoperiod; SD, short day photoperiod. We determined the expression stability of the candidate reference genes using the geNormPLUS program within qbasePLUS version 3. In these analyses we assumed that none of the selected genes were co-regulated since this is a prerequisite for geNormPLUS analysis. GeNormPLUS calculates the average gene expression stability (M) from the variation of the expression ratios of each pair of reference genes. This is based on the theory that two stable genes should share an identical expression ratio in all samples [21, 28]. Lower M values indicate more stable gene expression with an upper threshold of M = 0.5, above which the reference genes are not considered stable. GeNormPLUS ranked the candidate reference genes according to their M values, from least stable to most stable (Figure2). PT1 was ranked within the top three most stable genes for 7 out of the 8 genotype/tissue combinations and TIP4-like was ranked within the top three most stable genes for 5 out of the 8 genotype/tissue combinations. ANT and 18S rRNA were ranked as the least stable genes in 6 out of the 8 genotype/tissue combinations. Ranking profiles differed for the same tissues between the two Populus genotypes. Genes were ranked at the same position in only 12 instances when comparing the two genotypes. Compared to other tissues, bark showed the greatest variation in stability ranking between the two genotypes of the reference genes. In contrast, young leaves showed the most similarities with 5 genes ranking at the same position for both genotypes: PT1 and TIP4-like as the most stable and 18S rRNA CYC063 and ANT as the least stable. 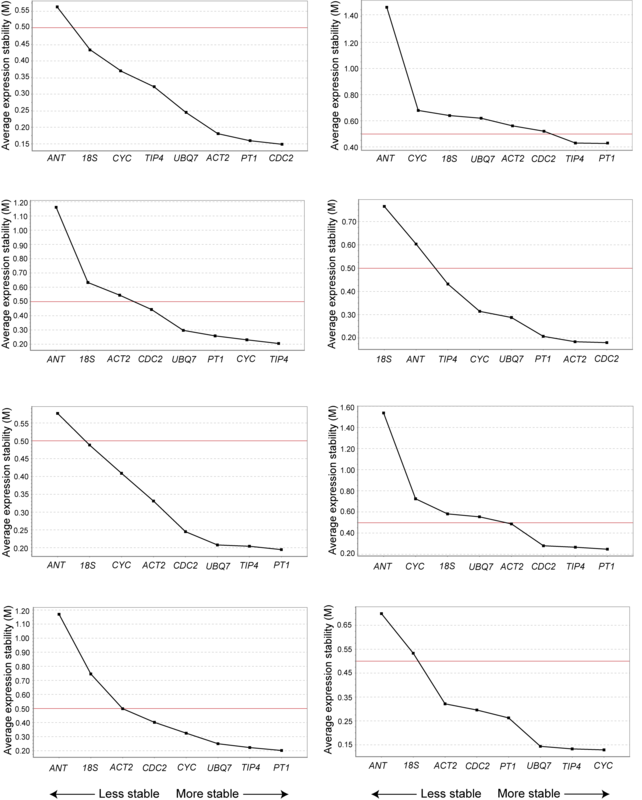 Average expression stability values (M) and ranking of candidate reference genes determined by geNorm PLUS . Candidate reference genes ordered from least stable (left) to most stable (right) in shoot tips/buds, young leaves, mature leaves and bark of both genotypes (P. trichocarpa and P. tremula x P. alba). The red line indicates the limit above which genes are considered non-stable (M = 0.5). GeNormPLUS also determines the minimum number of reference genes to include in normalization analysis by calculating the average pairwise variation (V) of normalization factors which is determined by the two most stable genes and the addition of the next most stable gene until all genes have been added . It has a cut-off value of 0.15, below which the addition of another reference gene has no significant effect and is not required. For samples of young leaves from P. trichocarpa, pairwise variation analysis showed that normalization should be performed with 3 reference genes since the V2/3 value was higher than 0.15 (Figure3). For all other tissues, the two most stable reference genes were sufficient to give a V value below 0.15. Determination of optimal number of reference genes by geNorm PLUS . Pairwise variation (V) analyses were performed to determine the optimum number of reference genes for normalization. V2/3 is the pairwise variation between the 2 most stable genes and the 3 most stable genes. V3/4 compares the 3 most stable genes with the 4 most stable genes, etc. The green line indicates the variation cut-off (V = 0.15) below which additional genes are not required for adequate normalization. BestKeeper determines stable expression by first calculating descriptive statistics for each reference gene using the mean Cq data of the technical replicates for each sample. Then, using pairwise correlation analysis, the program compares each reference gene to the BestKeeper Index (BKI) and calculates a Pearson’s correlation coefficient (r) and p-value . Higher correlation coefficients suggest more stable expression. Table3 shows the ranking of reference genes with corresponding (r) and p- values as determined by BestKeeper. CDC2 was one of the 3 most stable genes in 7 of the 8 genotype/tissue combinations (r ≥ 0.718, p-value = 0.001). ACT2 was ranked as one of the 3 most stable genes in 5 of the 8 genotype/tissue combinations (r ≥0.862, p-value = 0.001). Conversely, BestKeeper ranked TIP4-like as the least or second least stable gene in 6 out of 8 genotype/tissue combinations with the lowest correlation values of r = 0.057 (p-value = 0.837) in mature leaves of P. tremula x P. alba. Despite a low ranking in the bark of P. trichocarpa TIP4-like expression had a high correlation coefficient and significant p-value (r = 0.957, p-value = 0.001) when compared to the BKI. Rankings between the different tissues of the two genotypes were very distinct. Pfaffl et al. recommend that if the standard deviation of the mean Cq values for replicates for a reference gene is greater than 1 then the data is considered inconsistent and calculations should be performed again without these genes. We observed standard deviations greater than 1 in all genotype/tissue combinations except shoot tips (Additional file 1: Table S1). These reference genes were removed and the data was reanalyzed. 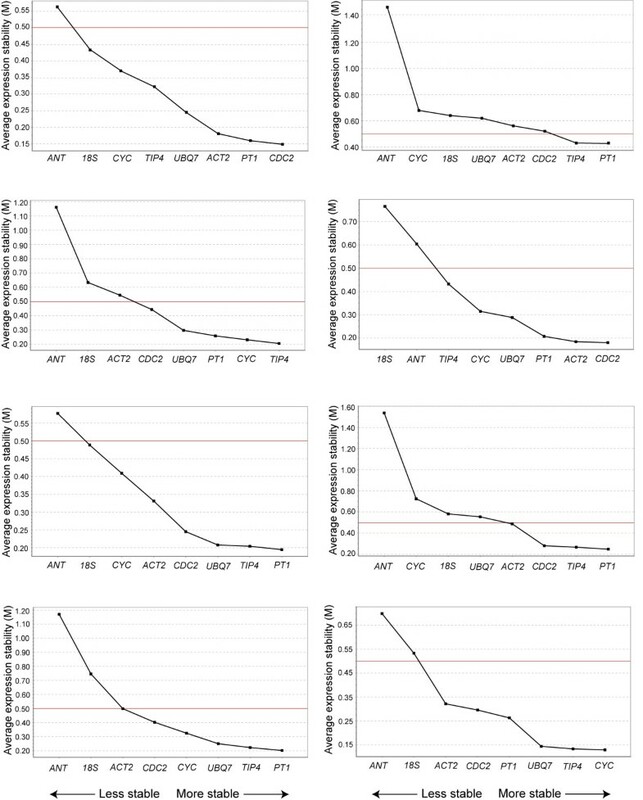 Removing these genes did not change the overall rankings for the remaining genes but resulted in increased correlation coefficients (r) for most of the remaining reference genes (Additional file 1: Table S1). Each candidate reference gene was compared to the BestKeeper Index to calculate a Pearson’s coefficient of correlation (r) and a p-value. Larger correlation coefficients indicate greater correlation with the index and is evidence of higher gene expression stability. In comparing candidate reference gene stability rankings produced by geNormPLUS and BestKeeper, we found that these two programs ranked the reference genes differently (Table4). For instance, BestKeeper frequently assigned ANT a middle ranking and even ranked it as the second most stable gene in young leaves of both genotypes. On the other hand, geNormPLUS consistently ranked ANT as the least or second least stable gene in all tissues. The rankings of 18S rRNA by geNormPLUS and BestKeeper also showed differences. 18S rRNA ranked as the least or second least stable gene when analyzed by geNormPLUS while BestKeeper assigned 18S rRNA a high or middle ranking except for bark tissues where it was ranked as one of the least stable genes. There were only 4 occurrences in P. trichocarpa where the two programs gave the same ranking for a gene: CYC063 in shoot tips and CDC2, UBQ7 and 18S rRNA in bark. In all tissues of P. tremula x P. alba and in mature leaves of P. trichocarpa, the genes recommended by geNormPLUS for normalization calculations were ranked amongst the 4 least stable genes by BestKeeper. Candidate reference genes ordered from most stable (top) to least stable (bottom) for each tissue by geNormPLUS and BestKeeper in P. trichocarpa and P. tremula x P. alba. Reference genes indentified by geNormPLUS for inclusion in normalization calculations are indicated by * symbol. Recent reports have questioned the validity of selecting reference genes for qPCR analysis of gene expression based on results from other species or different experimental regimes [15, 16, 29–31]. In this report we undertook a stability analysis of 8 reference genes expressed in various tissues of two genotypes of Populus grown in LD and SD conditions. The stability of the reference genes was then determined using two different programs: geNormPLUS and BestKeeper. In addition to these two programs, NormFinder is another program that measures reference gene expression stability . Together, these are the three widely cited programs used for stability analysis. GeNormPLUS has been cited over 4,000 times, followed by NormFinder with over 650 citations and BestKeeper with over 500 citations (determined by Google Scholar search). In contrast to geNormPLUS and BestKeeper, NormFinder requires defining two or more groups of samples composed of at least eight samples per group for accurate analysis . Since our experimental design did not meet these requirements NormFinder was not included in this study. Irrespective of the analysis program used to determine reference gene stability, the most stable reference genes vary among tissues of both genotypes. Besides variation in gene expression stability between tissues within a genotype, it was also found that reference gene stability also varies between genotypes within a given tissue. For example, in shoot tips/buds CDC2 was ranked by geNormPLUS as the most stable reference gene in P. trichocarpa but ranked as the fourth most stable reference gene in P. tremula x P. alba (Table4). BestKeeper ranked UBQ 7 as the most stable reference gene in shoot tips/buds in P. trichocarpa and as the fifth most stable gene in P. tremula x P. alba. This difference of ranking in the same tissues of the two genotypes occurred regardless of the program used. Although, geNormPLUS rankings between genotypes of the least stable reference genes were more consistent than rankings of the most stable genes. Previous studies on coffee and petunia [33, 34] also concluded that reference genes were different in different tissues for a single genotype and also for the same tissue between different genotypes. This variation in reference gene stability underscores the importance of empirically testing all samples in an experiment to validate reference gene stability. This report is a rigorous evaluation of reference gene stability in Populus and a valuable resource when compared to previous reports in Populus[22, 23]. Beside our adherence to the MIQE guidelines, there are additional distinctions between this report and previous reports. Brunner et al. determined reference gene stability using ANOVA and linear regression analyses while we used currently available methods capable of more refined statistics. An additional difference between the current study and Brunner et al. is that primers used in their study were designed from a limited number of ESTs, whereas we designed primers using sequences from the Populus genome, which is a more complete resource. Xu et al. used the same programs we used to evaluate stable reference genes in bark and root tissues during adventitious root formation. However, the reported amplification efficiencies were outside the range suggested by the MIQE guidelines making it difficult to determine the accuracy of their stability rankings. Finally, in this report we performed reference gene evaluations using the two important Populus genotypes, P. trichocarpa “Nisqually 1” and P. tremula x P. alba 717 1-B4. Consistent with prior reports, our results found that stability rankings were not consistent amongst geNormPLUS and BestKeeper programs [23, 35, 36]. These discrepancies are a consequence of the different statistical methods that the programs are based. BestKeeper performs pairwise correlation analysis using Cq values compared to an index value while geNormPLUS calculates the ratio of variation between pairs of reference genes. ANT is a good example of the differences between stability rankings. While ANT is not generally considered to be a reference gene, it was included in this study as a gene with documented variable expression in cambium . The mean Cq distributions of ANT clearly confirm expression in all genotype/tissue combinations we studied making ANT a suitable candidate reference gene to test. The mean Cq distributions show that ANT expression is variable (Figure1). Consistent with the report of variable ANT expression, geNormPLUS ranked ANT as the overall least stable gene in all genotype/tissue combinations. Yet BestKeeper assigned, in most cases, a high rank to ANT. Although geNormPLUS ranked ANT as one of the least stable reference genes in both genotypes and range of tissues, there may be unique conditions in which ANT could be used as a reference gene. For example, the Cq distributions in bark in P. trichocarpa indicate that ANT appears stable in samples up to 6 weeks of SD exposure (Figure1, G). This could account for the high correlation coefficients of ANT (r = 0.970, p = 0.001) in this tissue type as calculated by BestKeeper (Table3). Additionally, geNormPLUS generally ranked the expression of 18S rRNA as unstable in all genotype/tissue combinations while BestKeeper tended to rank this gene unstable in bark and more stable in the other tissues. The graphs of Cq distributions show that Cq values for 18S rRNA do not appear to be as stable compared to the other reference genes (Figure1) and the Cq distributions more closely agree with the assigned rankings by geNormPLUS than by BestKeeper. This calls attention to the importance of reviewing the Cq distributions in conjunction with the ranking profiles by expression stability programs for confirmation of stability. Regardless of its stability, inclusion of 18S rRNA as a reference gene for qPCR assays requires cDNA synthesized with random primers instead of oligodT primers. It is common to synthesize cDNA with oligodT primers to limit sample complexity when investigating differential expression by qPCR. Therefore, omitting 18S rRNA as a reference gene would allow a researcher to maintain a low sample complexity when synthesizing cDNA. For those reasons we do not recommend 18S rRNA. The purpose of this study was not to provide specific reference gene recommendations but to offer a set of rigorously tested reference genes that are potentially suitable as reference genes for expression analyses in Populus. Testing the PCR efficiencies of primer pairs in both genotypes revealed that PCR efficiencies were similar although not identical yet within the acceptable range. It is probable that these primers may also be suitable for use in other Populus species provided that adequate PCR efficiencies are validated . Researchers should carefully choose a gene stability analysis program that fits their experimental needs. Each program has limitations and specific requirements for analyses. For example, NormFinder requires at least 2 groups of 8 or more samples for accurate analyses . This is significant because it can be difficult to define logical groups that comprise an adequate number of samples within a group. There are reports in which samples are grouped in multiple ways, which affected the calculations and rankings [38, 39]. Results from BestKeeper can be difficult to interpret, as illustrated in this paper. High correlation coefficients and significant p-values can be calculated even for unstable reference genes. When considering geNormPLUS, researchers should take into account that the program currently does not perform analyses for a reference gene if the Cq data were collected from more than one plate, which may be impractical for large studies. Therefore, the choice of analysis program must be appropriate for the experimental design. The importance of using multiple reference genes for normalization analyses has long been established and including multiple reference genes for normalization is a component of MIQE guidelines [12, 28]. One of the unique features of geNormPLUS is the ability to calculate the minimum number of reference genes to include in normalization analyses. In this study, analysis with geNormPLUS indicates that the 2 most stable reference genes were adequate for normalization analyses except for one case where 3 reference genes were recommended. This offers an advantage in accurate normalization calculations compared to analysis with NormFinder or BestKeeper. If using these programs, including 3 or more stable reference genes is suggested as a “universally applicable method” . In this study, geNormPLUS is the program that best fits our experimental needs. It differentiates between biological and technical replicates and calculates the best number of reference genes needed for normalization. More practically, it is the most user-friendly program with clear indications of the most stable reference genes as well as integrated alerts that inform users of data errors or omissions. In this study it was possible to identify stable reference genes that can be employed to investigate changes in differential gene expression in Populus under controlled environments including LD, SD and SD with low temperatures. Rigorous testing of candidate reference genes can be time and energy intensive but it is crucial to obtaining valuable scientific conclusions. Here we provide a set of established reference genes for which we tested the normalization potential in a study of their expression stability in two poplar genotypes. We also conclude that geNormPLUS is the most useful program to determine the stability of reference genes. It calculates stability based on rigorous statistical methods, and integrates calculations to determine the appropriate number of reference genes for normalization and it is user-friendly. This report emphasizes the importance of the MIQE recommendations and promotes the continued adoption of the recommendations by researchers studying Populus. P. trichocarpa (Nisqually-1) plants were grown from cuttings prepared from greenhouse grown plants. P. tremula x P. alba clone (717 1-B4) plants were propagated using in vitro shoot cultures and rooted plantlets. Plants of both genotypes were grown in 2.2 L pots containing a commercial potting mix (Sunshine LC1) and fertilized with approximately 5 g of the slow release fertilizer (Nutricote, 18-3-3; Florikan, Sarasota, FL, USA). All photoperiod studies were conducted in controlled environment chambers (Conviron Inc., Winnipeg, Manitoba, Canada) at 18°C with a PAR at 50 cm above the surface of pots, ranging from 310–470 μmol m-2 s-1. To study the effect of changing photoperiods, plants were grown for 8 weeks in long-days (LD;16 h light/8 h dark) followed by short-days (SD; 8 h light/16 h dark) for an additional 12 weeks. During the last 4 weeks in SD, the temperature was lowered to 10°C day/4°C night. Various tissues were collected at 5 time points: 8 weeks LD and after 3, 6, 8 and 12 weeks SD. The tissues included apical shoot tips/buds, bark (between leaf plastochron index 8 and 9 [LPI 8–9]), young leaves (LPI 3) and mature leaves (LPI 9). Samples were immediately frozen in liquid N2 and stored at −80°C until used for RNA extraction. Triplicate biological samples were composed of the pooled tissues from 4 individuals (total of 12 plants). Primers were designed using MacVector version 11 (MacVector Inc., Cary, NC, USA) based on the following criteria: 18–25 nucleotides in length, GC content of 40-60%, product length ~60-150 bp, and designed to amplify products within 500 bp of the 3’ end [19, 24]. Primers were tested for optimum annealing temperature using a temperature gradient and for specificity with a melt curve. PCR amplification efficiencies for all primer pairs were calculated by the iQ5 software (Bio-Rad, Hercules, CA, USA) from a five-point calibration curve of ten-fold serial dilutions. Melt curves were performed for every run to confirm amplification of a single product. Total RNA was extracted using the RNeasy plant mini kit with the automated QIAcube (Qiagen, Valencia, CA, USA). Samples were ground in liquid N2 with a mortar and pestle. RLT buffer containing 1% beta-mercaptoethanol and 1% polyvinylpyrrolidone was added to 50 mL tubes containing ground tissue and vortexed thoroughly. Following suspension in the modified RLT buffer, 0.4 volumes 5 M potassium acetate, pH 6.5 was added to the buffer, mixed by inverting and incubated for 15 min on ice. Samples were centrifuged for 15 min at 15,000 g at 4°C. Supernatant was then loaded into the QIAcube and RNA extraction was performed with an on-column DNAse I (Qiagen, Valencia, CA, USA) digestion. RNA quality and quantity was assessed with microfluidics using the Experion™ automated electrophoresis system and RNA StdSens chips (Bio-Rad, Hercules, CA, USA). cDNA synthesis reactions were performed with 1 μg of total RNA and oligodT primers according to manufacturer’s instructions (RevertAid, Fermentas Inc., Glen Burnie, MD, USA). Separate reactions were performed for 18S rRNA using random primers instead of oligodT primers. The cDNA from triplicate first strand cDNA reactions was pooled and served as the template for triplicate technical qPCR reactions with the Maxima SYBR green qPCR master mix (Fermentas Inc., Glen Burnie, MD, USA) and detected with the iQ5 Real-Time PCR Detection System (Bio-Rad, Hercules, CA, USA). Cycling conditions consisted of 10 min at 95°C followed by 40 cycles of 15 sec at 95°C and 1 min at the optimum annealing temperature (Table2). Data from the iQ5 Real-Time Detection System (Bio-Rad, Hercules, CA, USA) were analysed with geNormPLUS in qbasePLUS version 3 (http://www.qbaseplus.com) and BestKeeper version 1 (http://gene-quantification.com/bestkeeper.html) . Emily A Pettengill, Cécile Parmentier-Line contributed equally to this work. EAP designed primers, designed experiments, collected and analyzed data and wrote the manuscript. CPL extracted and analyzed RNA, designed experiments, collected and analyzed data and edited the manuscript. GDC oversaw the project and edited the manuscript. All authors read and approved the final manuscript.